What do you know about careers in coding? I sat down with three people working in the field (You can find out more about them in the notes below) who shared their experiences and top tips for becoming a coder. 1. What skills or attributes make a good coder? You might be surprised to learn what skills you DON’T need to be a coder: you don’t need to be good at maths or science. As long as you’re determined to learn coding that's enough to get you going. You DO need “soft” skills like listening, teamwork and communications. The old stereotype of a nerdy coder who doesn't connect with others is not a reflection of the industry today. You also need to be persistent to overcome obstacles. In programming, things probably won’t work the first time but if you keep trying, you will eventually find the solution. It might take ten more tries but being persistent will pay off. If you like to solve problems and unravel mysteries, you’ll probably make a good coder. 2. Do you need to go to university to be a Coder? The short answer is no, you don’t need a university degree to be a coder and there are entry level jobs which don’t require degrees. So, how to begin? Get started now. Learn to code—you can even teach yourself with online resources, books and videos or sign up for a coding school. Then, prepare to learn on the job. What matters is how good you are rather than a degree. 3. What programming language should I learn? Python is also useful and its syntax is very like English. C++ and C Sharp are especially good for games. 4. What don’t you like or what are the biggest challenges in a coding career? Because coding is a collaborative process, one frustration cited by everyone was having the patience required to wait for some other part of the process to be completed before being able to jump in and do your own bit. Generally, criticism was hard to find. All the panelists love their jobs! 5. Why do you love your job? Answers like: Programming lets you do whatever you want to do; every bit of code you write is solving a puzzle; you can use creativity and logic in your work; you work with small teams and there is diversity in the work itself. 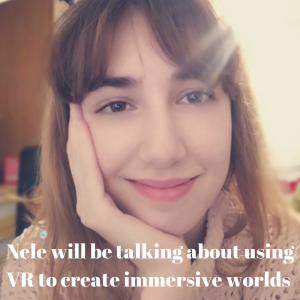 Our panel:Nele is a 3D artist an experienced developer and knows about coding in a VR and games context, she currently creates characters and assets for VR games – Coopinnovations. She works for https://www.coopinnovations.co.uk/ which provides immersive worlds and the technology that drives them. 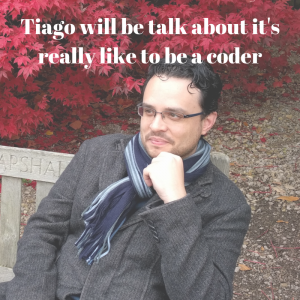 Tiago is a developer for PanIntelligence, business intelligence software to help businesses make better decisions from their data. He builds features and fixes problems. 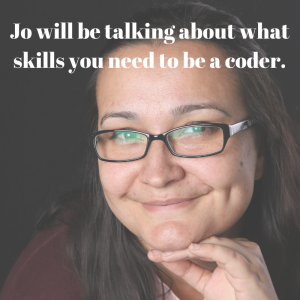 Jo - graduated July 2017 from Northcoders and has worked as a Software Developer since August 2017. Currently she's working at LADBible Group, which is redefining entertainment and news for a social generation. Thank you for joining the webinar and thank you to our panellists Jo, Tiago and Nele (and Neil who jumped in to talk about cyber security), who also provided the links below. Useful links from the webinar. CoderDojo: Learn technology in an informal and friendly environment. Find one close to you. CodeClub Projects: There's a few clubs geared towards young children but the projects are good for someone who's never done any code before no matter their age. The Mozilla Foundation (creators of the Firefox browser) have some neat help pages to get your started with web development. There are so many game jams happening all the time, you just have to pick one. Attending cyber security conferences such as OWASP's AppSec or BSides, which happens all around the world (there's actually one in Leeds in January). They often look for volunteers if cost is an issue although the BSides ones are typically very low cost. Also nearly all the talks will be put on YouTube, often the same day so that's great if you can't attend. To do some hacking yourself you could start with the OWASP's Juice Shop. Teachers who want more info should contact: Rebecca Auterson [email protected] Thank you Rebecca! CyberFirst Adventurers courses that students can sign up for on the website currently.